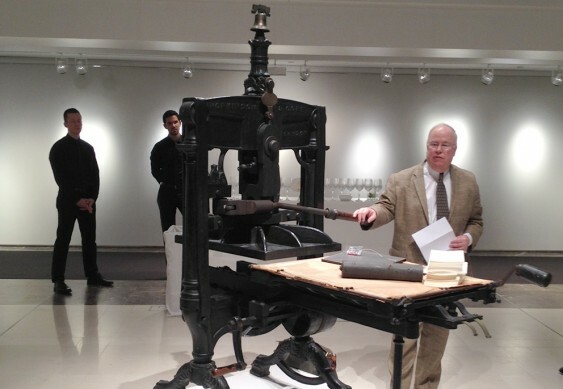 Jethro Lieberman speaks about the press at Christie’s on the eve of the auction. Photo: Paul Romaine. The Cary Graphic Arts Collection at Rochester Institute of Technology announced today that it has acquired the Kelmscott/Goudy press, so named because it was first owned by William Morris then later Frederic Goudy. This famous iron hand press auctioned by Christie’s on December 6, expected to sell for between $100,000-150,000, actually fetched $233,000. The 1891 London-built Hopkinson & Cope Improved Albion Press (No. 6551) will now join the Cary Collection’s Arthur M. Lowenthal Memorial Pressroom, a working collection of 15 historical printing presses and over 1,500 fonts of metal and wood type. Supporting study of the press is a collection of Kelmscott Press publications and an archive of material related to Frederic Goudy and Melbert B. Cary, Jr. (the namesake of the collection and the second owner of the press after Goudy.) Press Release. It was a poignant evening, that included Jethro reading from a letter by Sydney Cockerell addressed to J. Ben Lieberman. Attendees received a keepsake written by Jethro and many people stood for portraits with the press. Kelmscott Press bibliographer and former editor of Printing History, William S. Peterson was there with his collaborator and wife Sylvia Peterson. Former President of the William Morris Society, and long-time APHA supporter, Mark Samuels Lasner was also in attendance. Included in the sale of the press was a two-handled ink brayer, which may have been used by Kelmscott pressmen. A photo published in the April 1924 issue of The Inland Printer, shows Goudy holding an identical brayer, while his wife Bertha positions a sheet on the frisket. A photograph from the same session appears on the Kelmscott-Chaucer census website. An earlier version of this story reported that Jethro Lieberman’s keepsake includes Sydney Cockerell’s letter. It does not. The editor regrets the error. Sir Sydney Cockerell (1867–1962) had been William Morris’s private secretary and later director of the Fitzwilliam Museum at Cambridge. Fantastic purchase for the new owners! If anybody in that arena wants help on how to print on the Iron Handpress, I could entertain a trip to give a few lessons or workshops on setting up the press and printing chapbooks, broadsides or wood engravings, of which I have done all the above, as well as taught others. Once again, congratulations to the new owners! A further minor correction. Jethro Lieberman’s pamphlet, “50 Years a Typesetter” (The Press at James Pond, 2003) given as a keepsake at the Thursday event, has a quotation from a 1961 letter from Sydney Cockerell to J. Ben Lieberman that “any direct copying or adaptation of Morris’s types or ornaments would, in my opinion, be a fatal mistake.” (p.18). That excerpt was read at the event. The pamphlet is very worthwhile. It sketches the recent history of typesetting (from hand to mechanical to digital typesetting), and describes Jethro’s typesetting, his thoughts on hand setting metal type, and his father’s activities (including his business venture selling “Liberty Presses” in the 1960s). Fascinating window. His thoughts on the value of his hand composition are particularly well expressed (pp. 12-13). Is that pamphlet available in any other form than that of the keepsake from the event? I would be interested in reading that. The RIT Cary Graphic Arts Collection has updated its Facebook Album of Kelmscott/Goudy Press images. Now we know where the (that!) press which Goudy used, can be seen. Question: what happened to the types and other Goudy items which were once in the Goudy Typographic Laboratory (now folded into the Newhouse School of Communications) at Syracuse University? Note: in the early 1950s I was assistant to then-instructor Dave Norton at the lab. The Goudy types were a treasure. Dave’s own private collection of antique type(s) went to the International Printing Museum in Carson (LA) CA several years ago. The January 2012 issue of Printing History (N.S. 13) had an article by William La Moy (editor of Printing History and curator at Syracuse), “Frederic Fairchild Sherman and his Goudy Typefaces.” Their general Goudy collection is described here: http://library.syr.edu/digital/guides/g/goudy_fw.htm (includes the Sherman type). Perhaps someone will jump in. @George @Paul When I arrived in Syracuse in 2002 and started teaching letterpress classes to printmaking students at the “Goudy Typographic Lab,” I never let anyone touch the rare type. The shop itself had fallen into disrepair but thankfully the type’s “DO NOT USE” label worked over the years. Go figure. Anyway, after I befriended a fellow letterpress lover (the late Peter Graham) who was also the dean of Syracuse’s Bird Library, he arranged to have a type cabinet moved the library’s Special Collections. Since I stopped teaching the shop appears to have once again gone to seed, but at least we can rest assured that the rare types are out of harm’s way. By the way, the only “lost” type among those was a run of Sherman, to my recollection. @George @Paul RIT Cary Collection also maintains some rare Goudy Types that were acquired in the 1960s from the widow of printer, Howard Coggeshall, who was a longtime friend of FWG. We also have a smaller Albion iron hand press that was in Goudy’s possession. Professor David Norton from Syracuse University recently donated his personal type specimen collection to the Cary. Paul Romaine is Development Manager at the Center for Book Arts and an independent curator and editor based in New York. He serves as Executive Director of the Friends of Dard Hunter and was president of APHA from 2008-2012.